Having a handy list of low cholesterol foods is always useful when you are on a diet. Daily guidelines for recommended cholesterol intake! A long list of low cholesterol foods! A practical, delicious menu for a low cholesterol food day! Whether or not you are on a low cholesterol diet, it still makes sense that low cholesterol food and cholesterol lowering foods should make up the bulk of your daily nutritional intake. At first glance you may think that low cholesterol foods and cholesterol lowering foods are interchangeable, but they aren’t. Low cholesterol foods arenot the same as cholesterol lowering foods. You can have low cholesterol foods that are also cholesterol lowering. But remember, not all low cholesterol foods will lower cholesterol. And, always be on your guard. For a food to be truly low cholesterol it must contain less than 20mg of cholesterol per serving, sometimes food labels can be a bit misleading. Make sure you know what a “serving” equates to – one, two, three biscuits? Or perhaps it’s 100g or 200g, maybe (if you’re lucky!) it’s the whole packet. If you are unsure whether a food is OK to go ahead and eat, then check your list of low cholesterol foods before you put it in your mouth! If all you ever ate were foods that lowered your cholesterol then your diet would very soon become boring and difficult to stick to. That’s not to say it would be impossible, but the balance would be all wrong. It’s as important to have a healthy, balanced diet as it is to have a cholesterol lowering one. Without the recommended daily amounts of vitamins, minerals and anti-oxidants your body will not be working at its optimum level. Having a healthy heart is top of the agenda, but you have to make sure you have a healthy body as well to go with it so you can enjoy life to the full! The National Heart, Lung and Blood Institute’s National Cholesterol Education Program (US Department of Health & Human Services – NHLBI) recommends that you should have no more than 200mg of cholesterol per day if you are trying to lower your cholesterol levels. In a normal healthy person this can be increased to anything up to 300mg per day. 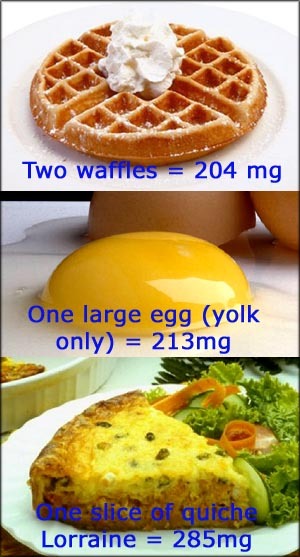 But what does 200mg of cholesterol look like on your plate? The following three common foods all contain over 200mg of cholesterol, so just a portion of these will blow your recommended daily allowance through the roof. One 4oz cheeseburger with a large shake on the side? This is just under 200mg. So it doesn’t leave a lot else left for the rest of the day, does it? It puts it into perspective though, doesn’t it? It can be so easy to have a high cholesterol meal without even thinking twice about it. So what should you be eating instead? Use this list of low cholesterol foods to help plan your meals. Unprocessed Foods – The Good Guys – Eat More of These! Generally speaking, unprocessed or whole foods are low in cholesterol. And, if you want to break the list of low cholesterol foods down even further, then non-animal based unprocessed foods are the ones you should be aiming for as the largest pile on your plate. If you are finding it difficult to picture the balance of foods you should be eating, then try to imagine that your daily intake of food is represented by a pyramid. At the bottom of a pyramid you have the largest area of stones. This is so it forms a solid supportive base to hold up the rest of the pyramid above it. It is this foundation layer that represents foods which contain no cholesterol and cholesterol lowering foods. These should make up the bulk of your food at every meal. So try and fill two-thirds of your plate with these good guys. 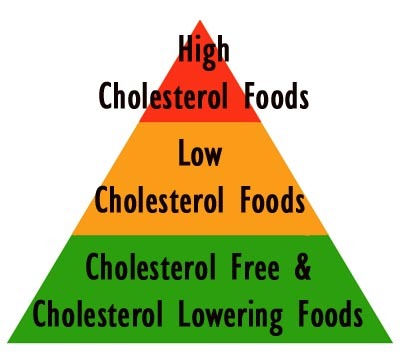 In the middle of the pyramid are the low cholesterol foods, ideally these should make up the rest of your meal, the remaining third. You can see what some of these are in the list of low cholesterol foods. At the very top of the pyramid are the foods which are high in cholesterol and should be avoided (or at least eaten in moderation). To put it another way, you should try and make sure there is no space left for these on your plate. For those of you struggling to imagine this pyramid, then just think of traffic signals. – Red – halt, danger! High cholesterol foods. You don’t need these. – Amber – warning! Low cholesterol foods, think about what you eating. – Green – go for it! Cholesterol free and cholesterol lowering foods. The List of Low Cholesterol Foods: Dig In! This is by no means an exhaustive list. But, we shall start with fruit and vegetables – naturally high in soluble fiber to help flush out all that nasty LDL, all fruits and vegetables are cholesterol free. Here is a brief selection that you might take inspiration from – you don’t just have to stick with apples and carrots! Variety is the key here, and with so many exotic types of fruit and vegetables available to buy all year round, you may as well take your pick. Fruit: apples, peaches, Cape gooseberry (physalis), kumquats, mangoes, pears, grapes, avocado, pineapple, passion fruit, Chinese gooseberry (kiwi), paw paw, guava, oranges, bananas. 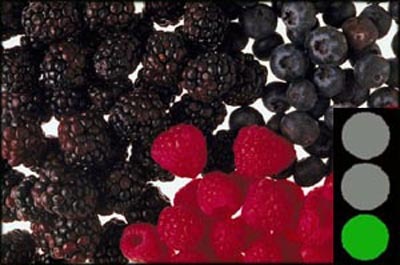 Berries such as blueberries, blackberries, strawberries, gooseberries, raspberries, or red and black currents. It doesn’t have to be just fresh fruit either, you can also have your fruit canned or dried – but do take note of any added sugar. Try blending mango, strawberries and banana for a thick and tasty juice. If you prefer your fruit drink a little less thick, perhaps in the form of a shake, then you can always use a non dairy alternative like rice milk or soy milk to thin it down. 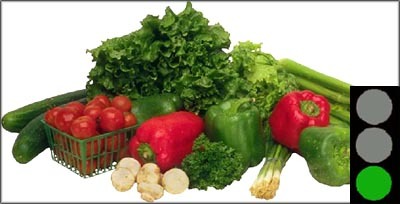 2) Vegetables and Salad – Great, so Many are Cholesterol Free! Depending on the diet you are following you may want to limit any vegetables that’s high in carbohydrate, but other than that all of the following are cholesterol free. Onions, carrot, garlic, potato, spinach, cassava, zucchini, egg plant, beetroot, asparagus, parsnips, broccoli, cabbage, lettuce, tomatoes, beans, peas, peppers, chillies, pak choy, chard, watercress, pumpkin, cauliflower, radish. The list is almost endless! Pick your favorites to help raise good cholesterol levels. 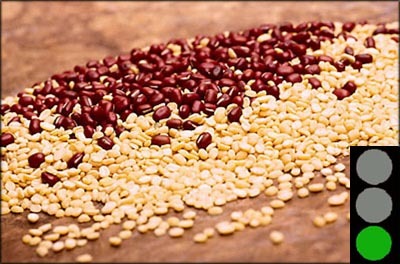 3) Legumes and Whole Grains – It Doesn’t Get any Better than This! Yes, you’ve guessed it – high in soluble fiber and cholesterol free. But, I bet that unless you’re a vegetarian you’ve hardly ever made use of the wonderful variety of legumes and gains that are out there. You know that you don’t just have to eat them in a bean stews or bean-burgers, right? How about adding a handful of kidney beans or chick peas to a winter soup? Orange lentils are great for thickening casseroles or use them on their own in a spicy curried dahl. Hummus is just a bowl pureed chickpeas and garlic, use it in sandwiches instead of full fat cream cheese. And, just to make a change from having potatoes with every meal, try quinoa or bulgar wheat instead – high in fiber and tasty as well. Animal fats and oils are high in saturated fats and are definitely on the high cholesterol food list. They should all be substituted for vegetable and nut oils. Use olive oil, sunflower oil, walnut oil or sesame oil – these are all good cholesterol foods on the list of low cholesterol foods, but there are many more to choose from as well. Milk contains cholesterol, half-fat or virtually fat free milk contains less cholesterol but it is still quite high in relative terms. 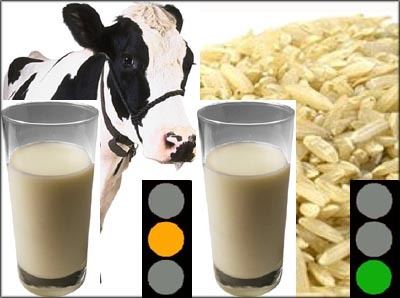 Instead of animal derived milks, you could try non-dairy options such as soy milk or rice milk, both of which are cholesterol free. 6) Meat – Yes, Finally! Now you know all about the wonderful variety you can have just from cholesterol free foods, you need to look at the low cholesterol options to make up the rest of your meal. Meats – lean meat, poultry and seafood, all a good source of protein, and oily fish is an especially good source of omega 3 oil which is one of the best cholesterol lowering foods. All of these cholesterol averages are for lean cuts of unprocessed meat cooked without fat. – Cod (steamed) 40mg per 85g. Taking inspiration from the list of low cholesterol foods you can see the sheer variety of foods that can raise good cholesterol. You can see that there is no excuse for not making good cholesterol foods the major part of your diet. So how about this for a sumptuous menu? Here is an example of a low cholesterol food day. Notice how the bulk of the food in these meals contains either no cholesterol or is a cholesterol lowering food. Breakfast – wholegrain cereal or porridge oats made with skimmed milk and topped with raisins. Glass of fruit juice. Wholegrain toast with a low cholesterol spread or stanol fortified spread, honey or marmalade. Mid morning snack – a fruit smoothie. Lunch – wholegrain flour tortilla wrap or pita bread filled with lettuce, tomato, skin free grilled chicken breast and spicy salsa sauce. Carrot and cucumber sticks with a hummus dip. Fat free fruit yogurt. Afternoon snack – handful of nuts and dried berries. Evening meal – steamed or poached salmon, on a bed of crushed butter beans and garlic, served with julienne carrots and courgette. A slice of low fat chocolate cheesecake (recipe below). To make the base: Melt the spread and the honey in pan, take off the heat add in the oats and stir. Spread the mixture on to a non-stick 8 inch pan. To make the topping: Whip together the cream cheese, ricotta and vanilla. Beat the egg whites together until they form soft peaks. Melt the chocolate in a bain-marie, cool slightly then slowly fold in to the egg whites. Fold this mixture in to the cheese and ricotta. Spoon the cream cheese mixture over the oat base and bake in an oven (375 degrees Fahrenheit or 190 degrees Celsius) for 35-40 minutes, or until firm to the touch. If you want you can serve this with a topping of sliced or pureed tangy fruits, such as mango or passion fruit. Use this list of low cholesterol foods to plan your meals, but don’t forget you aren’t limited to just these, there are many more low cholesterol foods we’ve not had time to mention, and do remember to check food labels first. Enjoy your food, but keep it heart healthy!